Recently I learned about a friend’s lifelong medical problems, which he’d done a great job of hiding. He’d had gut problems since he was a child, and in the past couple of years the symptoms had become severe and scary. In addition to pain and burning after eating, he was seeing large amounts of blood in the toilet. No doctors could explain what was going on, despite repeated batteries of testing. He was on a hamster wheel of treatment, switching between providers in an attempt to get answers; but each time, the doctors would recommend starting with diet changes, which he knew didn’t work. He was desperate and felt like no one was listening to him. Since this is ‘what I do,’ I offered to work with him to put together a visual representation of his health before his next doctor appointment. Here’s how I did it and what we learned. He’d shown up to my house with a 4-page, single spaced document in which he had written down the things he wanted to say — symptom descriptions, tests he’d had, diets and interventions he’d tried, family history, and more. The narrative contained a lot of useful information, but I could see that it could be difficult for a doctor to absorb in a short amount of time. We started with a timeline of events. I had taped together four 11x17 pages and drawn a line to represent his whole life. Using his prepared narrative, we hunched over the timeline and noted key events; as we worked, he also remembered things that were not in his document. Next I left the room and gave him some materials to put together a picture of what his body feels like when he’s feeling good and feeling bad. I’d prepared a sheet of icons that he could cut out and tape to the body shape, or he could simply draw on it. He took about 10 minutes to do this. When I came back, I was extremely impressed by what he had put together. I asked him to talk me through it, and as he did I wrote down quotes along the side of the image. 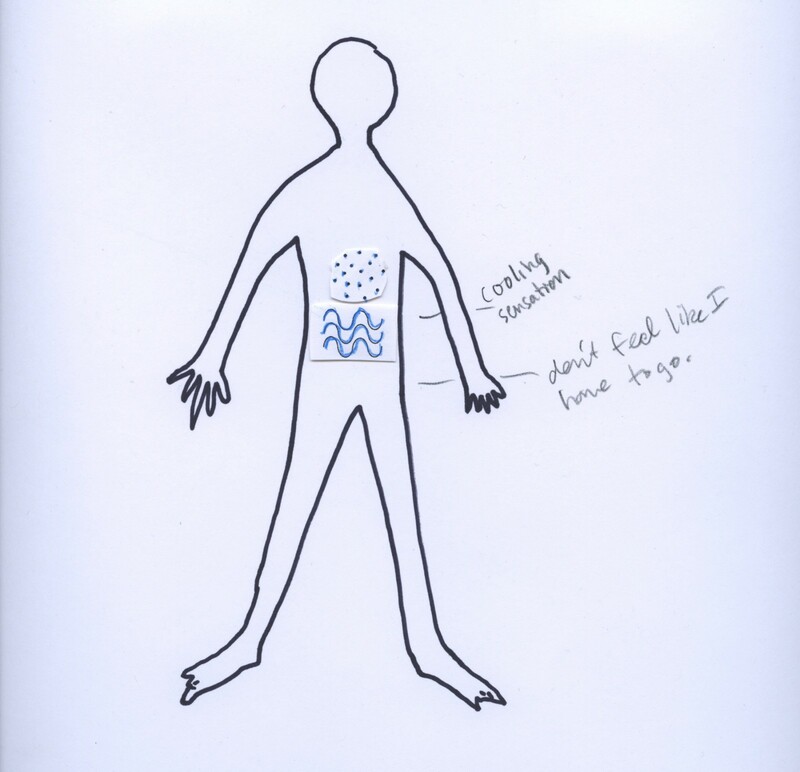 At this point we had a timeline, drawings of what ‘feeling good’ and ‘feeling bad’ look like, and a list of questions and theories that had come up along the way. Aside from not getting any answers or solid reasoning for his symptoms, my friend’s biggest frustration was that new doctors kept wanting to have him try the same treatments, even though he was sure they were not helping. We decided to put together a matrix showing what ‘helps’ and ‘does not help’ along with any supporting evidence. After that first meeting, I put together two documents. 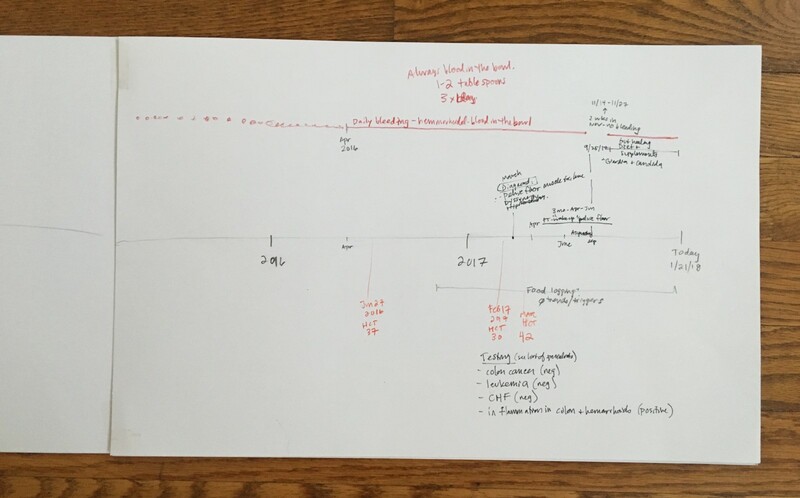 First, I created a digital version of the timeline we’d begun on paper. For this I used Adobe Illustrator. 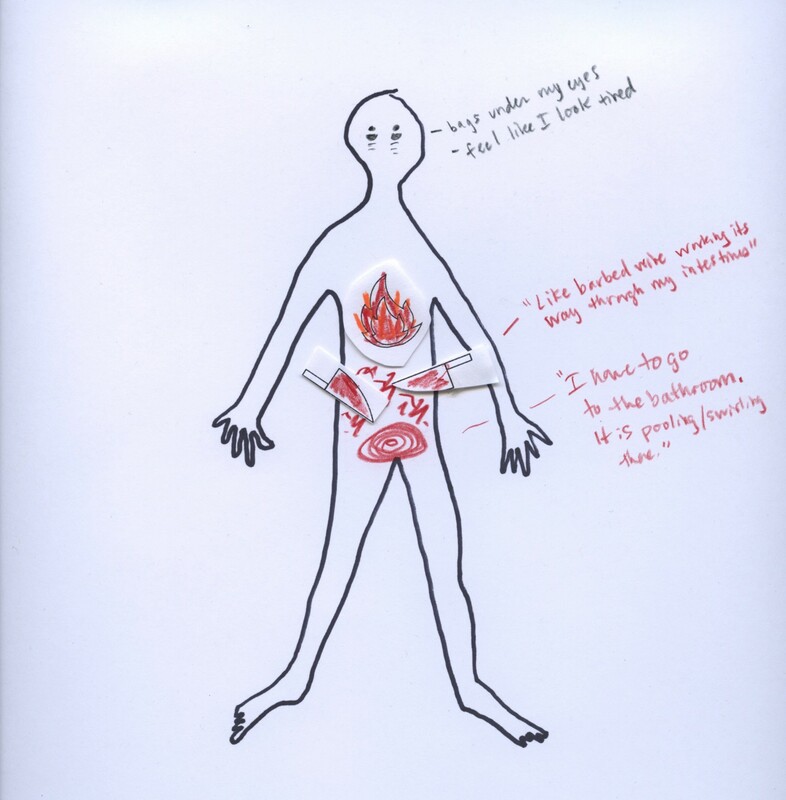 I wanted to communicate a few things at-a-glance: the fact that he had been experiencing pain and burning his entire life, the timeline of his bleeding, and the volume of tests that had been done. On closer look, the test descriptions contained notes about results and findings whenever possible. We met a few days before the appointment to briefly go through everything and make a plan for how he would talk through the information. There’s a lot there, as you can see. My friend called me after his appointment and expressed some frustration that doctors should have to make same-time decisions upon receiving such a large volume of information; he felt this was not fair to the doctors and wished they could have more time to consider his case. That would be nice, but unfortunately that is not how medical billing works at this point. Doctors aren’t usually paid for time they spend outside of appointments pondering their cases. I accompanied him to the procedure, which went well, and afterward he said the staff had been holding copies of his print-outs and referring to them in pre-procedure conversations. He’d brought copies to show them, but they’d already had their own. That is a great testament to their utility; it also speaks to the lack of information doctors often face. What we assembled was basically a patient-oriented personal health record; one that, while not comprehensive, contained the important major points that he needed to communicate. It brought together information from the many different doctors, clinics and institutions at which he’d been seen over the years. It presented information in a more succinct way than any health record possibly could (at this point), because we took the time to groom cross-institutional information, combine it with his personal experiences, consider how a doctor would need to consume it, and deliberately lay it out. This experience impressed upon me the need for thoughtful, careful customization of a person’s health story. I’ve spent a lot of time visualizing my own health history, but my friend’s story contained unique complexities: large numbers of tests and procedures performed by different doctors at different institutions, being instructed over and over to try the same ineffective treatments, and lifelong unexplained pain. Because of these factors, the end result of our work looked much different from my own personal experiments. I suspect that, while there is probably a set of standard visual tools that would cover many patient storytelling scenarios, there will always be some need for flexibility and personalization. As of this writing, my friend has a tentative answer for the burning and has a team of doctors working to address his other problems. It has only been 10 days since his first appointment with the GI doctor, and he said he’s gotten further with this team than he did in a whole year with his previous doctors. He also said this is the first time in his life that he’s gone into doctor appointments knowing what he wanted to say and communicate; this has given him a feeling of control over a situation in which he has felt very powerless. No matter what happens, I consider his new sense of empowerment a marker of success. Are you looking for a way to create something like this for yourself? 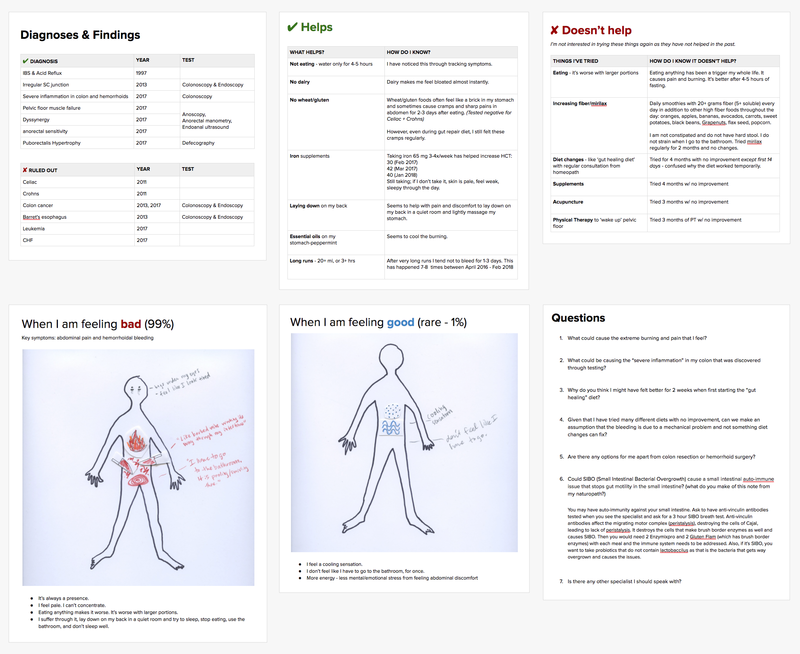 To start, check out these worksheets I put together to help people map out timelines and symptoms. 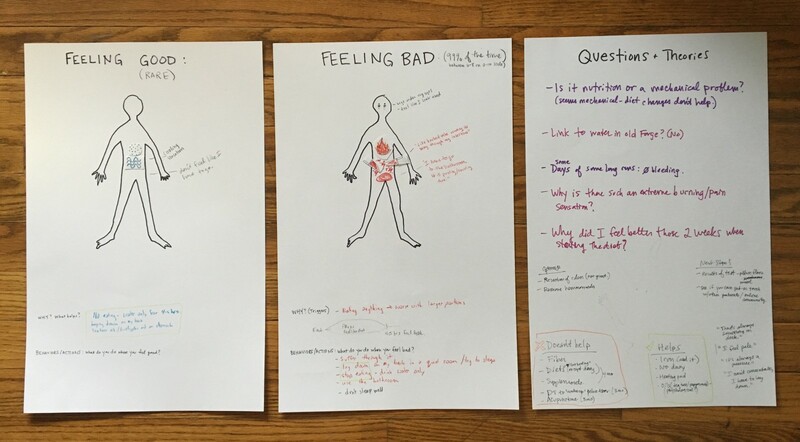 I’m in the process of exploring more ways of making patient stories more visual, so that patients and doctors can better understand what’s happening and work together more efficiently. I’m calling this Pictal. Stay tuned!